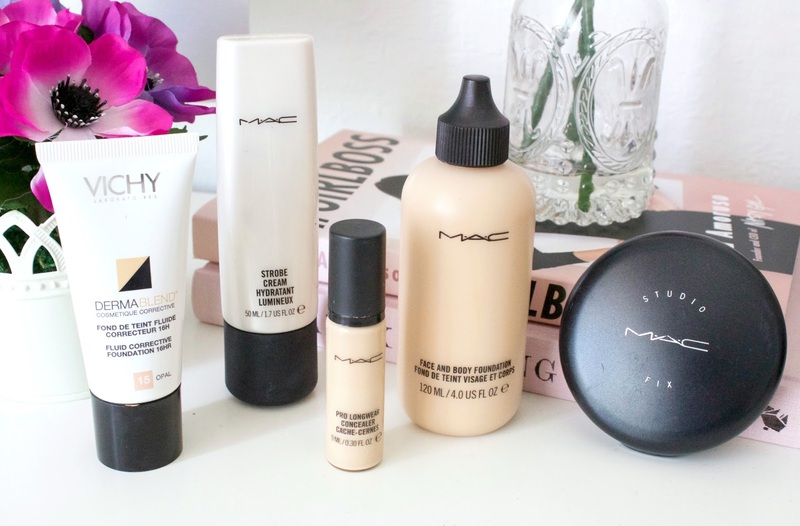 Today I wanted to share my Summer foundation and concealer routine. I swap up the products I use in the warmer months for a lighweight and heat-proof base. I thought this may be helpful to some, before I found a routine that worked for me I spent ages researching what other people use and testing numerous different products. I also wanted to share some tips and advice I’ve learnt in the makeup industry on helping to make your makeup last longer. My routine may look like a lot of products, but it’s what works for me. But then again this may be simple compared to others base routines. It’s just a matter of finding products that work for your skin, which can seem like a challenge! It’s also fairly MAC based, which I’ve only realised now I sit down to write this post. I just happen to really like MAC products, and find they work for my skin. 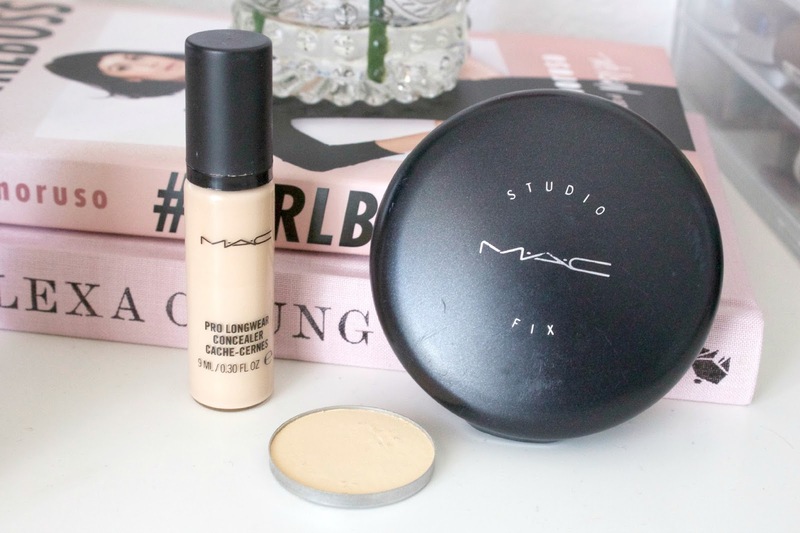 To start off with I use the MAC Strobe Cream to prime my skin before applying foundation. It brightens, smoothes and adds moisture to my dull looking skin. It gives a beautiful ‘glow from within’ without looking oily, and my foundation applies so beautifully over this and lasts all day. This foundation is my all time favourite, holy grail precious baby, seriously I LOVE this stuff. It’s so lightweight, applies perfectly and provides a light-medium buildable coverage without caking or looking heavy on the skin. It’s available in a both a 50ml or 120ml bottle, which is going to last a long time compared to the standard 30ml most foundations contain. I have combination skin, and once I’ve set it with a powder it lasts all day. Although this is classed as a foundation, I actually use it as a concealer, but you have to approach this product with caution. It’s a very heavy duty “concealer” and I only use it on problem areas, such as blemishes or areas of redness. It can look heavy on the skin if you apply too much, so I like to built it up in light layers using a damp Beauty Blender. This is the powder I use to set my foundation and concealer. It doesn’t cake, or look heavy on the skin. I find it really helps to disguise my pores whilst helping my makeup last longer and add a light amount of coverage. You can also use this as a powder foundation, which sometimes I do and just wear this and a little bit of concealer. I like to use a different concealer on my under eye area as I find the Vichy too thick for the eye area. The MAC Pro Longwear concealer is raved about by lots of bloggers/beauty gurus, and it totally deserves the hype. It feels light on the skin whilst providing medium to full coverage, and doesn’t crease when set with a powder. This powder is from the Anastasia Contour Kit, but can also be purchased individually. I use this to set the MAC Pro Longer concealer, and it helps prevent creasing and lightly brightens the under eye area. Make sure you’re preparing the skin for makeup application by following a skincare routine. I like to cleanse, tone and moisturise before I apply my makeup. Also leave your moisturiser for about 15-20 before makeup so it’s fully absorbed into the skin. My favourite moisturiser is the LUSH Vanishing Cream, as this also helps my makeup adhere to my skin and last longer. I also really recommend the MAC Lightful C Marine Bright Softening Lotion, a brilliant toner that smoothes the skin perfectly prior to makeup application. Primer isn’t always the best thing. I’ve found that certain foundations really don’t work with a primer, no matter how many primers you try. Primers are used to prepare the skin for makeup application, whether its to control oil, hydrate, minimise pores or calm redness. But sometimes they can make the situation worse as the can be too oily, too drying, make the foundation cake or separate on the skin, or make the foundation apply unevenly. So before you give up on a foundation, try going without a primer. Or if you don’t use a primer, give one a try! 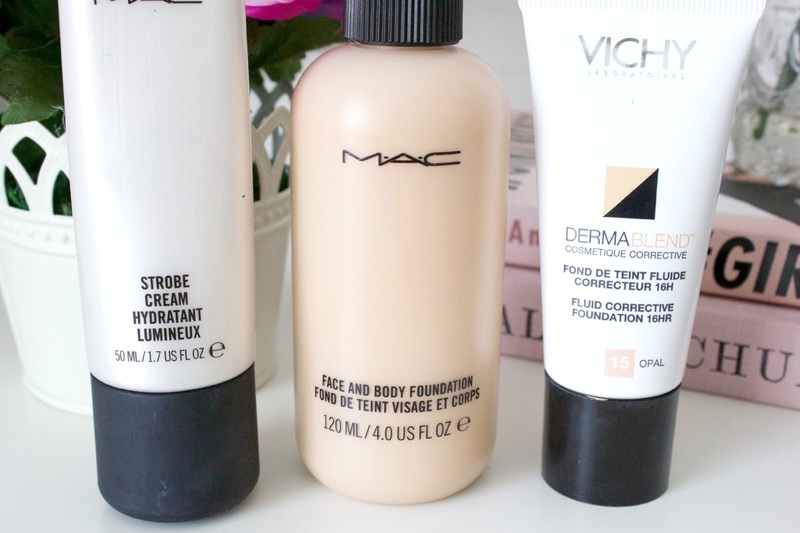 The only primer I personally use is the MAC Strobe Cream as it really works wonders for my skin and whatever foundation I use on top. I’ve tried various different primers but never really got on with them. Strobe Cream is the way to go! Foundations are all aimed at different skin types, claiming different miracle promises. If you’re really struggling to find a foundation that will last, try something that’s aimed at being long wearing, or even waterproof. I recommend the MAC Pro Longwear foundation, Estee Lauder Double Wear, or the L’Oreal True Match foundation. I’ve tried so many foundations over the years, from drugstore to high end. I personally find that high end foundations work better for me, but high end foundations come with the high end price tag. I’ve been disheartened before when I’ve found that a foundation hasn’t worked for me, especially after paying such a high price. So I always say to people ask for a sample! The good thing about high end cosmetic companies is that most of them do give samples. I always used to be too nervous/worried the staff would judge me for asking for a sample, but now I just think of the money I’m not wasting if it doesn’t work for me. The counter staff shouldn’t get annoyed/angry (and if they do, walk away, don’t give them your time or money!). It’s a good way to test the colour in natural lighting as well, and if the foundation doesn’t work for you, then you’ve not wasted any money. Some foundations would literally disappear within a couple of hours if not set with a powder. Powder can help makeup to last longer, but sometimes adding a powder can make you look caked or super powdery. I fully understand this problem, I always used to find it a nightmare, until I worked out how to do it properly. It comes down to finding the right powder for your skin, and not applying too much. If you don’t need powder (lucky you!) then don’t use it, it’s less product to put on your skin. I have combination skin (dry with an oily t-zone), so I usually only powder my t-zone as the other areas don’t need it. When applying powder, lightly press the brush into the skin instead of dragging it over the skin, as that can move the foundation and concealer around. My favourite powders are the MAC Studio Fix Powder (my holy grail!! perfect for combination skin), Chanel Poudre Universelle Libre (great for normal-dry or mature skin), Smashbox Photo Set Finishing Powder (great for oily skin), Rimmel Stay Matte (super affordable powder perfect for oily skin!) and MAC Mineralize Skinfinish Natural (good for all skin types). Makeup setting sprays; some people love them, some people hate them. I happen to love them. I haven’t found they necessarily help prolong the lasting power of my makeup, but I find them great to freshen up makeup and get rid of that powdery look. My favourites are MAC Fix+, Urban Decay All Nighter and the Mario Badescu Facial Spray. So I hope this post was helpful to someone, I’ve got a post going up tomorrow sharing more makeup tips and advice on creating the perfect base- which I wanted to keep in this post, but just made it ridiculously long! Thanks for reading.